Viewers soon heard from Obama how all the sacrifice he must suffer through as President, such as “the inability to just take a walk,” is all “worth it” when he hears about how an ObamaCare provision has saved someone from dying of cancer. Yes, it takes “remarkable candor” to tout yourself as magnanimous, but you’d think a journalist of Pelley’s stature wouldn’t be so excitedly gullible. One of the things that you learn after you’ve been in this office for a while is the pomp, the circumstance, the title, the Air Force One, all that stuff probably isn’t worth the sacrifice with respect to the time lost from your family, the inability to just take a walk and go out for a drive. What makes it worth it is when you meet some couple that says, “you know what? Our kid was able to stay on our health insurance plan and it turns out they were just diagnosed with a curable cancer but if they hadn’t stayed on our plan we would haven’t caught it.” That’s what makes it worth it. SCOTT PELLEY: This week we have our interview with the President and there was a remarkable moment of candor when he told us the sacrifices he makes being President wouldn’t be worth it except for one thing. Listen for it. He brought it up while we were talking about the bitter deadlock between him and the Republicans who control the House. 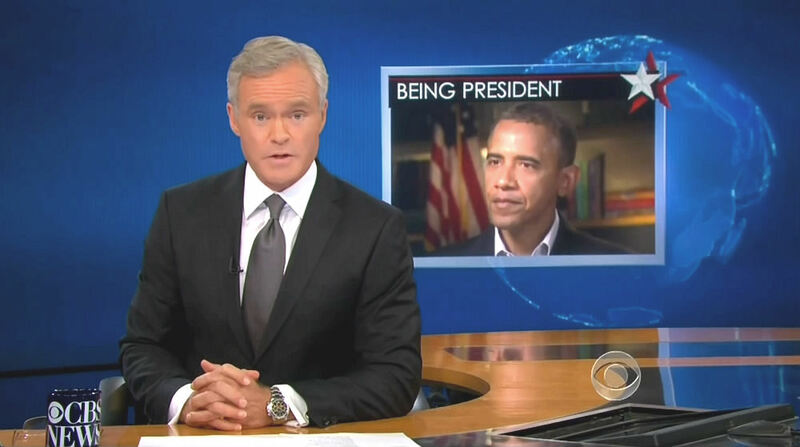 PELLEY TO OBAMA: The folks at home are so concerned about Washington’s apparent inability to get big things done. How can you assure the American people that you are willing to go halfway and make a compromise with these people that you have apparently such acrimony with? PRESIDENT BARACK OBAMA: Scott, I’ve got to tell you, there may be acrimony directed towards me but, you know what? That’s not unique towards my presidency. I’m willing to go more than halfway. And I’ve displayed that. I think that throughout my political career I’ve shown not only an instinct but a desire to find common ground. What I’m not willing to do is to slash education spending or, you know, health care for poor and needy children. And the reason I’m not willing to do that is because it’s not going to help the economy grow. Independent economists who have looked at it have said this would actually slow down the recovery, it wouldn’t speed it up so it wouldn’t increase jobs right now. It wouldn’t reduce the deficit. My entire interest is to deliver for middle-class families out there that are struggling everyday. And they are working hard and -- you know, one of the things that you learn after you’ve been in this office for a while is the pomp, the circumstance, the title, the Air Force One, all that stuff probably isn’t worth the sacrifice with respect to the time lost from your family, the inability to just take a walk and go out for a drive. What makes it worth it is when you meet some couple that says, “you know what? Our kid was able to stay on our health insurance plan and it turns out they were just diagnosed with a curable cancer but if they hadn’t stayed on our plan we would haven’t caught it.” That’s what makes it worth it and any ideas that are out there -- Republican, Democrat, wherever it’s coming from -- if it can help deliver on that, then I’m going to be right there ready to go.